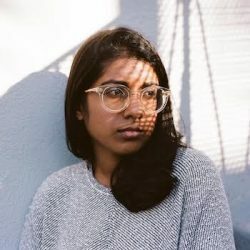 We’re excited to add recently signed writer/director Minhal Baig to our database of signed directors! In January, Minhal was signed to StrangeLove in the US and UK. Minhal Baig graduated from Yale University in 2012 with a Bachelors degree in Fine Arts. She is a current member of Film Fatales. In 2015, she wrote & directed, One Night, her directorial debut. One Night premiered at the Austin Film Festival in 2016, and released in theaters & on VOD in February of 2017. Minhal also wrote & directed the short film, Hala, about a Muslim teenager who struggles to reconcile her personal desires with family expectations. The short was featured on Nylon, Short of the Week, Film Shortage and chosen as a Vimeo Staff Pick. Her film, After Sophie, featured above, premiered on Nowness. In 2016, her feature-length screenplay for Hala landed on The Black List, an annual list of Hollywood’s most-liked scripts. She is at work on the feature-length film of Hala. Tell us a little bit about your background and how you got started making films. I started out as a painter, actually. I was studying fine arts in college and took a few playwriting classes. There’s an amazing professor there, Donald Margulies, who taught me so much about structure and storytelling. I wasn’t even a theater major and he just let me into his class. I learned more about story in that class than from anywhere else, and it was a lifechanging experience. I graduated with several full-length plays. Summer of 2011, I had worked as a development intern for Scott Rudin Productions, which was such a rush. I learned so much about filmmaking by being there. For a moment, I thought I wanted to be a producer. I was encouraged to head to Los Angeles and work at an agency, so I did. I survived assistant life at UTA for four months before quitting. I realized I didn’t want to be a development executive and that I wanted to create. I started working on my first feature script in 2012, which we shot in 2014, finished in 2015 and premiered last year at Austin Film Festival and finally came out this February. While I was in post, I wrote the feature script for Hala and I knew I had to make the short so people would understand what kind of film I was trying to make. We shot in 2015, it was released in 2016 and now I’m on track to be in production on the feature this year (fingers crossed.) Suffice to say, it’s taken many, many years to be where I am. You’re both a screenwriter and a director. How do those two skill sets inform one another? For me, they are inseparable. I generate all my own ideas and spend a lot of time digging and thinking about why these stories are important and why I’m uniquely suited to sharing them. I would be open to directing scripts I didn’t write, but so far I’ve been really creatively fulfilled writing my own projects and really living with a story long before I direct it. The writing process is more important than anything else. The writing is the hard work that comes before directing – which is really just a lot of fun. Writing is like making plans for building the house and the director is building it – in the best way they know how. All my writing is pretty personal and if I did write for other directors, it would have to be a director that I really believe in. Tell us a little bit about your screenplay Hala. It’s a coming-of-age story about a Muslim teenager who’s reconciling her personal desires with her obligations to her family and faith. It’s based on my experiences growing up Muslim in Chicago. It’s not autobiographical, but there’s large parts of my life and the people I know in the story. What drew you to exploring the subject matter of After Sophie, your latest short? I wanted to explore grief and loss in an unconventional format. I was really inspired by this horror film called Lake Mungo. It’s the scariest film I’ve seen in my life! I wanted to make an anxiety-inducing, psychological horror that was character-driven and explored these bigger ideas about teenage suicide, depression and how sometimes we don’t really know the people we love. Any exciting upcoming work we should be looking out for? There is so much going on, it’s kind of a whirlwind. I’m doing a lot of writing right now and it’s really exciting. I’m writing two features and developing a pilot. It will take a few years for all of this to come together but I have a big plan for my next few narrative projects post-Hala. Since you recently just signed to StrangeLove in the US and UK, could you tell us what the process of getting signed was like? The process of my being signed was very fortuitous and I’m not sure it’s exactly replicable. For a year, I had been querying commercial production companies, but eventually I stopped. I worked briefly for a director at Smuggler and learned more about what it’s really like pitching on commercials. That was a very eye-opening experience. I’m lucky to have been a fly on the wall for that. As for how I was signed – a friend and director – AG Rojas – posted about my music video for Brandyn Burnette on his Instagram and all these commercial folks started following me. I’m not sure if that’s exactly how I was found, but it was around the same time that I was approached by a few production companies for representation. Why do you think it’s so important for companies to showcase more diverse directorial voices? Directing, in my opinion, is not just a technical craft. It’s about having a perspective, having things to say. It’s really important for directors to have different life experiences so that our films don’t end up looking, feeling and sounding the same. Directing is really about outlook; we need a diversity of outlooks to really represent the breadth of life’s experiences. Women and minorities are not less talented or less qualified to do the job than their white, male counterparts. They’re consistently given fewer opportunities to showcase what they’re capable of, and it’s a vicious cycle where executives believe that they don’t have the experience to do a job when they’ve never been given a chance. It’s a serious problem in commercials but also in narrative film. The sexism and discrimination is deeply real and I’ve certainly felt it. Do you have any advice for other women interested in careers behind the camera? Make work and put it on the Internet. Rinse and repeat. Develop a peer group of filmmakers. Find creative collaborators who believe in the stories you want to tell. Generate your own ideas. Never expect anyone to hire you to do something that you haven’t already done. Don’t get discouraged. Don’t let anyone tell you that you can’t do something.